by means of AES via POWERLINK. G3 Fieldbus - Electronics Made Easy! The next-generation electronic platform that allows you easy access to connections; it's easy to assemble and install, commission, and maintain. It includes a graphic display for configuration and diagnostics, easy robust connections, and is highly distributable. In addition to the wide range of modules available for the extremely compact X20 system, its division into three parts means that wiring and servicing are a snap. With its well thought-out details and a sophisticated ergonomic design, the X20 system is more than a remote I/O system – it's a complete control solution. The X20 system family makes it possible to combine the exact components needed to meet any application requirements. The X67 system – Mount, connect and you're ready to go! This is the new dimension for remote I/O mounted directly on the machine. Its credit card size design allows for mounting in the smallest areas. No space whatsoever is required in the control cabinet. IP67 protection withstands the harshest environments. As fast as a centralized solution. Connections are made using open fieldbus systems. CREVIS FnIO R-Series, a remote IO System, is ultra-compact sized and applied the RTB (Removable Terminal Block) for users’ safety and convenience. FnIO R-Series provides the high-speed scan time (Min. 400us), and meets POWERLINK conformance, CE, UL, RoHS, & Marine Certifications (DNV, LR, ABS, GL, BV) for various customers. SL VARIO consists of a central module and up to 14 function modules. This modular configuration guarantees an individual adaption to nearly all safety requirements in a machine or plant. The whole variety of safety functions like emergency stops, light curtains or drive monitoring can be realized quick and simple with the software tool VARIO DESIGNER. 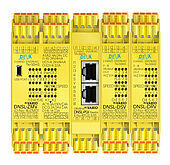 The central module contains 20 inputs, 6 safe semiconductor outputs and 2 (resp. 6) relay outputs. Seven different function modules are available to extend the system. 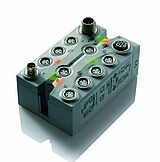 The POWERLINK fieldbus module realizes the communication with the PLC. Various diagnostic tools and the software function “Validation” are simplifying the start-up of the machine. The CPX-Terminal is a cost effective and flexible electrical I/O terminal available in IP65/67 for on-site installation, or IP20 for cabinet installation. Together with the highly modular valve terminals MPA or VTSA, an optimal synthesis of pneumatics, electrics and motion control is possible. The ioCONTROLLER as high speed slave in the PLC or embedded as an intelligent process unit for all IPC's is always the first choice when super-fast automation is required. Control, measure, regulate and calculate, analog or digital : the ioCONTROLLER can handle erverything, and all in microseconds. As the active bus module or subsystem without PLC cycle time limit the ioCONTROLLER fits any PLC and takes in a PLC project independently all the tasks that need to be faster than the PLC cycle time limit. 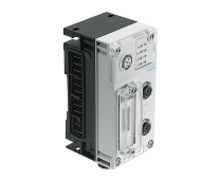 As the PLC, also the ioCONTROLLER is flexible and can be programmed individually. The ioCONTROLLER connects the world of the PLC with the world of microcontrollers. Nevertheless, the ioCONTROLLER degreed standard with comfortable features, such as Min-/Max or average value filter, edge trigger able counter (16- bit) or limit value monitoring. Another feature is the oversampling on all 12 analog inputs with distributed clocks. 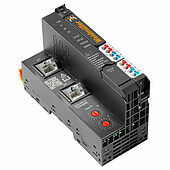 Isolated 10 A power supply for inputs and outputs maximises system resources and reduced the need for power-feed modules. Extensive diagnostic functions from module and channel LEDs. Integrated web server for testing and diagnostic purposes – local on-site or through remote access via the fieldbus. As the first remote I/O system, u-remote offers you full integrability of modular, scalable controlled nodes in your Ethernet POWERLINK environment. Using modular XDDs, you create your automation solutions even more flexibly, economically and individually - with full interoperability with your POWERLINK controller.